My Dogs Love Me: Oh, Bloody Poop! I just hate it... I just hate dealing with bloody poop. First, it was Shark with Parvo... Then, it was China and PJ with Parvo. This time, it's Buchi with bloody stool. Warning: The image you're about to see will scar you for life! I blurred it, but be warned! The actual non-pixelated photo is directly at the bottom. Time to close your eyes. Now that that's out of the way, let me tell you the story of Buchi's bloody dog poop. Yesterday, one of our housemates called me to check where Buchi was. And she starts the conversation with something like this, "don't get worried, okay?" Seriously?!? If it's something about the dogs, I get all ballistic and insanely worried. So, I follow her downstairs and she presents me with the bloody mucoidal stool of the evil Shih Tzu who's full sickies (just kidding on the evil part)! Lo and behold, a new present in the form of feces with blood and mucus. (Apologies for my bluntness. I just too stressed at the moment). Actual photo. Sorry for grossing anybody out. I immediately take a sample of the messy thing, place it on a container, take its picture, and have Buchi taken to the vet. Bad News: It got me worried sick (especially since we've been having the bi-monthly vet check-up since June 2013). I've considered a number of things: from the meds his taking tirelessly and his current lifestyle because of the E-collar. Good News: The vet says she couldn't find anything on the sample. However, she did mention that Buchi had an upset stomach due to overeating. Yes, thin dogs DO overeat. 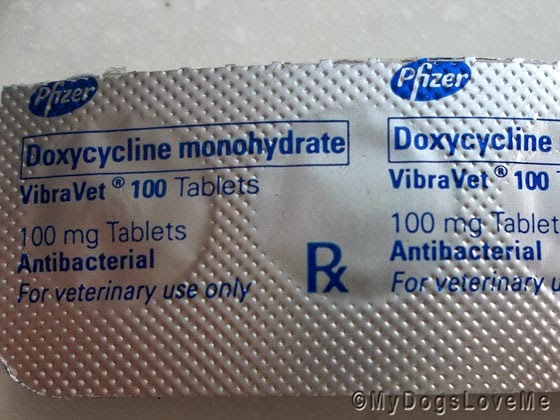 Nonetheless, Doctor M prescribed Vibravet (Doxycycline monohydrate) for Buchi's stool problem. Treatment: Just to follow our new medication and keep a close eye on the culprit (*cough* evil little Shih Tzu with skin and poop problems). 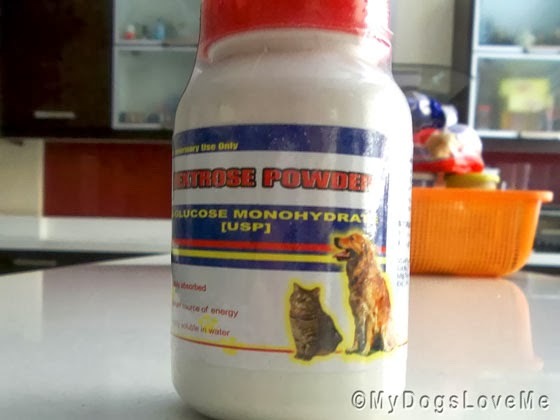 And the usual Dextrose Powder. Has anybody ever experienced dealing with so many problems at one time? Aww it is not nice indeed and we hope it works. Have a super Saturday. We're happy it wasn't anything BAD!! Crossing paws that all works well and the bloody stool goes bye-bye FAST! We too are glad the vet doesn't think it is serious, but it would sure scare the poop out of us! Wow! You've even had more vet visits lately than we have! Glad it's not Parvo again. Oh, Haopee, we are so sorry that you are dealing with so many issues right now! We are glad that this was not something really bad, though, and hope that Buchi is all better soon. 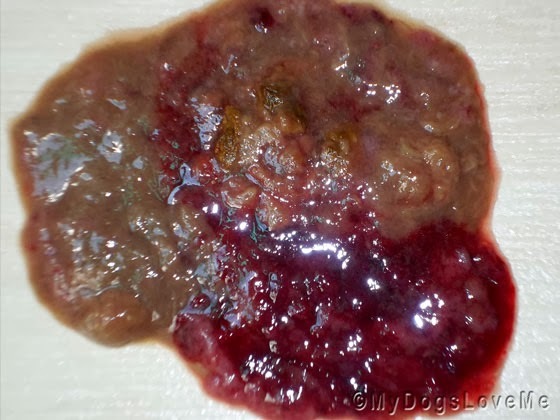 I HAVE BEEN SEEING ALOT OF DOGS AT THE DOG PARK WITH POOP THAT LOOKS JUST LIKE THAT ONE IN THE PIC IS THAT PARVO? AT THE DOG PARK THEY CHECK EVERYONES SHOTS ALL THE TIME AND IF THE DOG DOES NOT HAVE ITS SHOTS THEY TURN THEM AWAY! IS THERE A DOG FLU GOING AROUND? Don't panic. This one is because of an upset stomach. After the doctor look it through the microscope and found nothing, Buchi came back with those meds. I think that dog park is just taking precautions, which is the right thing to do. A bloody poop can also mean worm infestation, bacterial problems, or as I've mentioned earlier an upset stomach. I'm not sure there is such a thing as a dog flu. There is distemper and Parvo for puppies and seniors--complete avoidable with updated vaccinations.